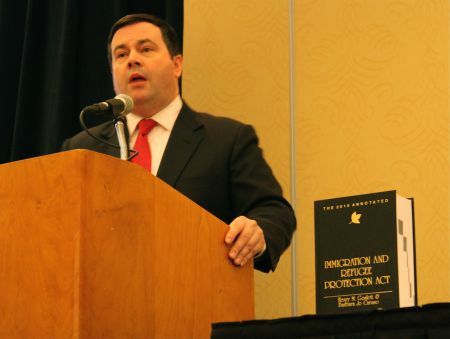 On Friday Jason Kenney, Canada’s minister of citizenship, immigration and multiculturalism, spoke at Halifax’s Marriot Hotel as part of a national conference on citizenship and immigration law. In his speech, “Balanced Refugee Reform”, he argued for a streamlined immigration system to fast track a 60,000-claim backlog of refugee applications. His proposed process would establish a list of “safe countries”, mimicking systems found in the United Kingdom, France and Greece. He said a panel of public servants would choose “safe countries” based on “objective criteria” such as the number of claims from each country; if a country had a large number of claims and the majority of those claims were found to be untrue, the panel would look at the country’s human rights record before declaring the country “safe”. “Sometimes every now and then we have a large number of refugee claims from democratic countries that protect human rights, almost all of which are rejected from our system, and we need to be able to send a message to the people who organize those waves of false asylum claims that they’re not going to be able to stay in Canada for a long period of time,” Kenney said. At 7:30 on Friday morning, demonstrators from the Halifax arm of No One Is Illegal dropped a banner off the side of an overpass near the hotel that read: “Status for refugees! 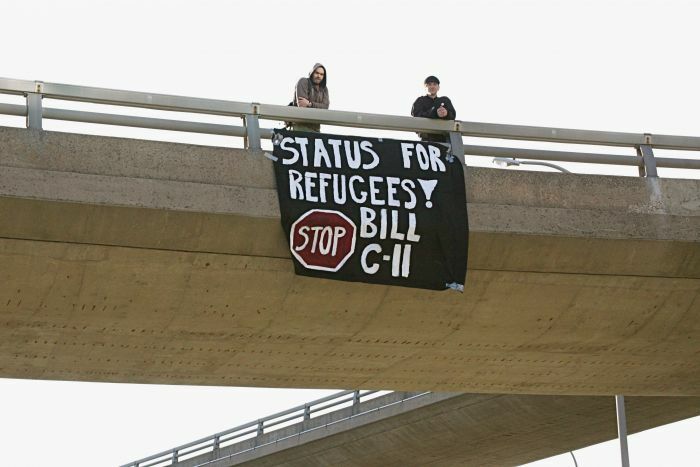 Stop Bill-C11”. The Canadian group’s criticisms of Kenney’s proposed reforms are many -- mainly focusing on the “unfair” two-tier system that would deny some applicants access to an appeal based on nationality. They are not alone; the Canadian Council for Refugees and other human rights organizations have raised similar concerns. “It's the people who face real risks who will suffer most from these 'fast track' reforms. It makes it harder to be accepted as a refugee in Canada, which is already difficult”, No One Is Illegal member David Parker said in a release. “This erodes the whole concept of justice by allowing non-judges to determine a refugee's risk not based on the individual, but based on origin. This is discrimination, and is unacceptable for a country that claims to uphold human rights”. Under Kenney’s proposed system, civil servants rather than independent judges would interview refugees and have the power to deny them access. The Canadian Council for Refugees has pointed out that countries currently using civil servants frequently deny refugee claims that are later overturned on appeal. But that appeal process would not be accessible for people from “safe countries”. The minister said his system would solve the refugee claim backlog, but No One Is Illegal said the Conservatives created the backlog, which was non-existent in 2005 when the party took power. During his speech, Kenney said the number of claims fluctuates over time and has increased considerably over the last three years. The Geneva Convention on Refugees states that a refugee should not be deported to his or her country of origin if there is a well-founded fear of persecution, torture or death upon return. In February, Eritrean refugee Habtom Kibraeb hung himself from a tree in Clayton Park. The former captain of his country’s military sought asylum in Canada, but his claim was denied because our country considers the Eritrean military to be a violator of human rights. Kibraeb left the military and spoke against its ideology. He said he feared torture and death upon return to his country – a fear confirmed by his suicide, not by Canada. Under the proposed system, a refugee would be assessed based on nationality first and individual asylum claim second. Submitted by Halifax Anonymous (not verified) on Thu, 05/20/2010 - 22:11. Just a little dismayed about this article. Umm, why is Kenney quoted so much at length? Kenney's comments are deliberately misleading. Words like 'objective criteria', 'false asylum claims': come on. Quoting him doesn't inform readers, it misinforms them. -why does the author say the two-tier system is "unfair", she should be saying it's inherently racist. Here's the real story. I wish you would run a story that sounded a little more like this. with fundamental shifts in immigration and refugee policy under Kenney. in power, the number of approved asylum claims has dropped by 56%. actually a dismantling of an already minimalist refugee protection system. make to the Board is an infamous anti-gay activist, Doug Cryer. though they were all subsequently released. pay, the denial of basic entitlements, and lack of labour protections. assistance – already grossly inadequate – to refugee claimants. colonial languages of English and French. • He has said that he will not tolerate refugee claimants who are “bogus”. Muslim women not to wear certain clothes. • Labelling Iraq war resisters as bogus refugee claimants. before the apartheid state of Israel did. It’s time to give Kenney the boot – Fire Kenney! Submitted by A (not verified) on Fri, 05/21/2010 - 14:13. '"Grassroots" means that for each topic we cover, we talk to the people directly affected by policies or activities first. Once a journalist thoroughly understands the story of those directly affected and has time and resources left over, she brings their questions to those making the decisions: politicians, corporate executives, and so on'. It appears that this journalist did exactly the opposite--and to make matters worse, did so by relying almost exclusively on one of Canada's most hated politicians. Quoting Jason Kenney--someone who has consistently made anti-immigrant, racist comments, and whom grassroots groups consider the worst immigration minister in recent history--at such length without any kind of thorough consideration of the arguments against him (or, from the sounds of it, even interviewing a critic) is not only bad journalism, but is also extremely detrimental to the struggles of refugees and migrants who are denied any kind of justice in the country. At any rate, I just wanted to say that I was considering becoming a member of the Coop, but I found this article disgusting and will have to reconsider. Submitted by HBeaumont on Sat, 05/22/2010 - 16:05. I have a strong bias against Jason Kenney. I'm currently researching and writing a story about how his immigration policy affects refugees and asylum seekers with mental illness. I'm not impressed by his policies. My attempt to balance the article may therefore have been overshot because I was worried about showing my bias. I will certainly try to do better next time. However, quoting him directly means he is accountable to what he has said. I was there to cover his speech. I'm writing a larger story about the issue that will use his quotes in context. I did not have time that day to find an asylum applicant to tell her or his story. I posted this story after reading a press release from No One Is Illegal that was published as an article on the Halifax Media Co-op. I thought the two articles would run side by side, thus balancing the issue for readers. I would also point out that I was not paid for this article. This was voluntary, as are all but two of my Media Co-op stories. For a reader to say they reconsidered membership because of an article that was not financially solicited is ludicrous. Volunteer writers are hard to come by, and under-appreciated. When I read comments that criticize unpaid work in a way that is not constructive, it makes me reconsider writing for the Media Co-op. Please research the model you were considering funding before attacking volunteer authors. Submitted by bsichel on Mon, 05/24/2010 - 10:28. Thanks to all for your comments. Although no article is perfect, the HMC strives to be a relevant source of grassroots and underreported news for the Halifax region. In this case the author reported on a speech and action that were not at all mentioned in the mainstream media, and brought attention to local angles on the national issue of 'refugee reform'. The HMC prioritizes in-depth examinations of grassroots issues, such as the ones seen here and here by the same author, for example. At present we have the budget to pay for one such article per month; the rest of the content is produced by volunteers. As our sustainer base grows we hope to finance more investigative content. The commenters above - especially the first, who presents what appears to be well-researched criticism of Kenney's record - are encouraged to submit their own content to the HMC website. (That's a serious invitation, not a sarcastic one!) Check out the contributor guidelines section and/or e-mail hillary@mediacoop.ca or ben@mediacoop.ca for more information. Submitted by Asaf (not verified) on Tue, 05/25/2010 - 01:54. I read Hilary's article. It's fine for a news article. She obviously put a decent chunk of work into it, and I know she didn't intend in any way to prop up Canada's fucked and racist immigration system, and I don't see how she did that. I would have gone about it differently, but if I actually was trying to write a news article, I wouldn't be able to veer too far from the model -- I've tried in the past, but with frustration . As soon as you make an argument or take an obvious political position, it's not considered a news article anymore, but "opinion" whether or not it's full of facts. I think the crux of the issue here are the limits of a "news" article. I've brought up the point before in different words. I personally don't do "news" articles because I do not see the value in placing limitations on the content I'm trying to put forward. I operate in the same manner with my radio show. That's how I roll. However, there has been a certain amount of societal conditioning that has validated the model of modern journalism, which I think has amounted to a problematic rejection of "emotional sounding" content. So, unfortunately, there is a place for "news" (groan) because that's what a lot of people are looking for.